Shares of Realogy, the owner of Century 21 and Coldwell Banker, surged 22% in its IPO Thursday. Investors are making a bold gamble that the housing rebound will be steep and swift with the initial public offering of Realogy. Realogy, which owns Century 21, Coldwell Banker, Corcoran and Sotheby's International Realty, raised more than $1 billion through its initial public offering that priced Wednesday night at $27 a share -- the high end of its estimated range. It's the third-largest IPO of the year behind Facebook (FB) and Banco Santander's Mexican subsidiary (BSMX). Shares of Realogy (RLGY) began trading on the New York Stock Exchange Thursday morning, and quickly surged 29% above its IPO price. Realogy is the only publicly traded real estate franchise. Its main competitors, such as Re/Max and Keller Williams, are private and much smaller. "Investors want exposure to the housing market," said Francis Gaskins, founder of boutique research firm IPO Desktop, "If you want to play the real estate broker market, it's the only game in town. The question is whether it's a good game." Gaskins is telling his clients to steer clear. Realogy, which has a market value of $3.3 billion, is saddled with roughly $4.5 billion in debt from its private equity backer, Apollo Global Management (APO), and said it will use its IPO proceeds to pay that down. 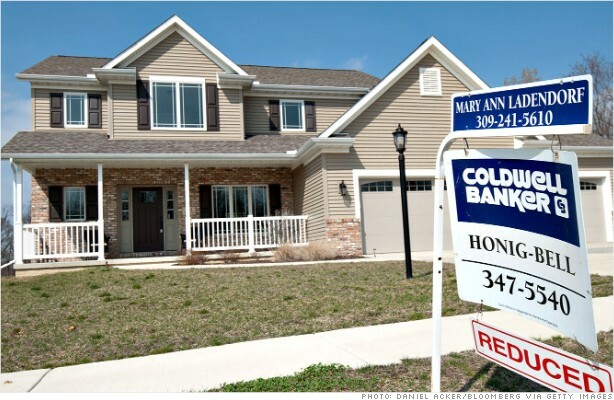 So far, the housing market rebound hasn't translated into profits for the the brokerage firm. Realogy's revenue increased 9% during the first half of 2012, but the real estate firm still lost $51 million during that time frame, after paying fees to Apollo. Realogy's IPO is also a crucial test for Apollo. The private equity firm has attempted to take five companies public this year, and investors haven't fared well in any of them. The PE firm pulled CKE Restaurants, which owns Carl's Jr., in early August. But the other three companies, Caesar's Entertainment Group (CZR), Rexnord (RXN), and Berry Plastics (BERY) are down 32%, 3% and 12% respectively from where their IPO's priced. Overall, IPOs have generated returns of roughly 10% this year, trailing the S&P 500's (SPX) 16% increase, according to IPO research firm Renaissance Capital. Realogy's debut comes during a busy week for IPOs. 10 companies were expected to price this week, but one, Garrison Capital, pulled its offering. Also Thursday, Shutterstock (SSTK), which sells stock photos, also debuted and started trading 32% above its IPO price of $17.